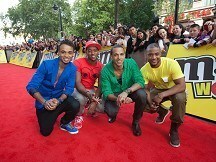 JLS would love to work with Rihanna, among others. The chart-topping boy band - Marvin Humes, Aston Merrygold, JB Gill and Oritse Williams - have a dream wishlist of who they would like to collaborate with, and the Umbrella songstress is top of the list. "We'd love to work with the likes of Rihanna, Bruno Mars and Jay-Z," said Marvin. "We would love to work with Tinie Tempah again. There are a lot of people out there, so we will wait and see." JLS, who launched the new M&M's World store in London, are currently lining up some surprises for their forthcoming third album. "Fans can expect some surprises, but we're not going to say who," teased Marvin. "We are working on some other collaborations and we are really excited about it. We don't want to say anything, because nothing is confirmed, but fingers crossed."